Rehabilitation work on the 3,050-metre aged runway pavement at the airport is expected to begin by the second week of February next year and be completed by July. Airport authorities sprung into action due to extreme pressure following frequent cracks in the runway at the country’s sole international airport that have raised safety concerns. 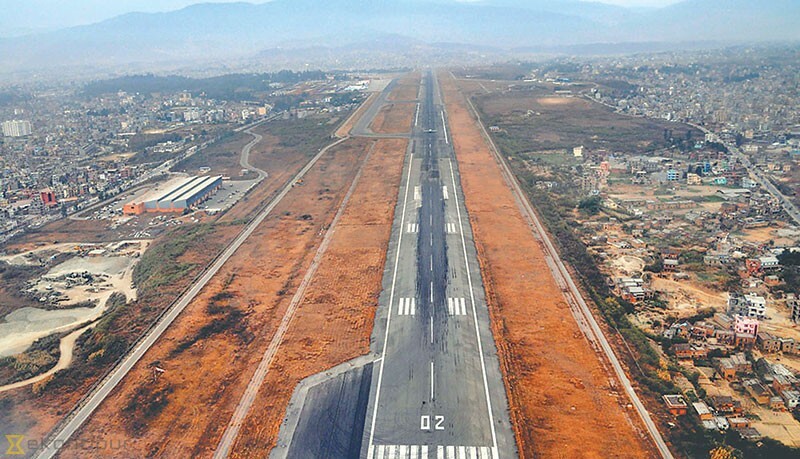 Authorities had put the TIA runway rehabilitation project on hold until the international airport in Bhairahawa is constructed after being frustrated by its intermittent progress. Meanwhile, a five-year working plan unveiled recently by the Tourism Ministry has issued a completion deadline of mid-July 2019 for the TIA runway rehabilitation project. The project is expected to pick prequalified bidders within 45 days after issuing a notice inviting prequalified bidders to submit financial proposals within 15 days, said Raj Kumar Chettri, general manager of TIA. In March 2017, the project prequalified four firms following the completion of their technical evaluation. The prequalified companies are China National Aero Technology International Engineering Corporation, China Harbor Engineering, Beijing Changdao Municipal Engineering Group and a Nepali-Chinese joint venture consisting of China Railway No 5 Engineering Group and Swachchhanda Nirman Sewa. However, the project was bogged down by problems. According to Chettri, the winning contractor will be given four months to make preparations. The company will be required to have all its logistics and construction materials in place before it is allowed on the runway. The airport will have to be shut down from 12 midnight to 6 am daily to carry out the runway rehabilitation works, according to TIA. For the last six years, TIA has been forbidding aircraft weighing more than 196 tonnes to land on its tattered runway to prevent further damage. The old runway has been affecting smooth operation of aircraft due to repeated occurrences of cracks in the pavement. While cracks and uneven surfaces can cause dangerous take-offs and landings, airline officials said they had been facing hours of delay almost every day during the rainy season, frustrating travellers and causing financial distress for airlines. Scores of flights have been diverted or delayed in recent years due to problems in the runway. Trouble mainly occurs during the rainy season. This monsoon, the runway has developed cracks more than 20 times, according to airline operators. The Civil Aviation Authority of Nepal (Caan) will dip into the Airport Development Fund (ADF) to finance the project. Since July 2014, Caan has been collecting an extra Rs1,000 in airport development tax from each passenger departing on international flights from TIA. The money will be spent on projects to improve facilities at TIA. A study conducted by Caan in 2014 had concluded that the runway at TIA was not strong enough to handle wide-body jets due to its ageing asphalt foundation, and distress is caused to the upper surface instantly when heavy planes land on it. Repeated occurrences of cracks on the runway have been affecting smooth operation of aircraft since 2011. When compared to the core part of the runway between 2006 and 2013, damage to the intermediate layers was caused by the operation of large jets like the Airbus A330 and Boeing 777, according to Caan. In 2013, there were 1,000 operations of A330-300 aircraft, 955 of Boeing 777 and 452 of A330-200, and the numbers are expected to double in the next 20 years.